You can fight hair loss naturally and combat the hormones that affect baldness, and you may receive other beneficial health effects, too. 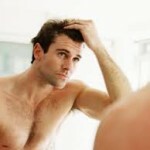 Muira Puama, Nettle Root, and Saw Palmetto are among natural remedies for hair loss. You must also remember the natural vitamins and minerals that help combat hair loss: Biotin, magnesium, zinc, and vitamin B6. Not only do these natural supplements fit into a nutritious lifestyle, it also helps in the war against hair loss.